The year 2017 marks the 46th edition of Cozumel's biggest fishing fiesta! Whether you are a fisherman or a circumstantial visitor to the island, you cannot let this event pass. 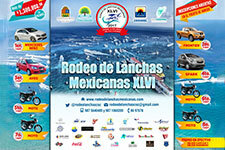 The upcoming weekend of May 13th and 14th, 2017, will feature the 46th edition of the "Rodeo de Lanchas Mexicanas"; the Cozumel's major fishing tournament. The renowned event is, without a doubt, the oldest and most important fishing tournament, out of a circuit of 21 annual events developed in 9 ports along the shore of the eastern state of Quintana Roo, México. The tournament is also the best payout, this year the overall winner can reel in a Mercedez-Benz car. The states' governor, Carlos Joaquin, will shoot the traditional blank to initiate the competition, which attracts participants from Mexico, the USA, and the Caribbean. 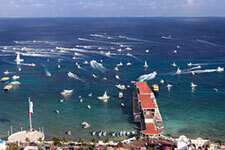 It is a thrilling experience to attend to the departure of 170 roaring boats as it was the last year. 200 fishing boats are expected to participate this year. The departure is scheduled this coming Saturday, May 13th at 8:00 hrs on the San Miguel pier (downtown's). Different activities will take place on the southern docking side of the pier along the day until 18:00 hrs. when the organization closes the weighing and registration of the day's catch. Johonce Bawkston from Texas, onboard Gotcha! 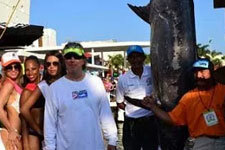 became the overall winner of the tournament with 39,850 points with a magnificent blue marlin prize weighing 398.5 lbs. He set a new "record of all times" for the biggest marlin ever caught in the tournament, and for the largest general score. He left the mark definitely high for this year's edition. The second place followed him with 30,400 points, almost a 10,000 points gap. 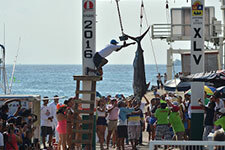 Since the 2013 edition, the tournament organization modified the old scoring system to a Catch and Release method, utterly detailing how the released catch is officially registered. As it is a billfish tournament, the rules give the best points to such kind of fish, this is, 1000 points for a Sailfish, 2000 points for a white marlin and 3000 points for a blue marlin. An extra 1000 points may be earned for a "grand slam" which is to catch an individual of the every three species formerly noted. The Sea Queen, winner of the 2nd place in the 2015 edition scored the first grand slam sportfishing as a sustainable activity. since the implementation of the new rules. Minor points are given to other game fish: Mackerel 50, wahoo, tuna and other related tuna fish 40, mahi-mahi 30, and barracuda 20. Any other species gets meager 15 points. The catch and release modality contributes to ensuring Even than detailed rules help to avoid the old fishing practice of "when in doubt, exaggerate" they still cannot get rid of the well-known "nothing makes a fish bigger than almost being caught!" he, he, just kidding. If you are a lousy fisher but quite a party animal, I'll see you by the pier!